Size of Male: 2-6 lbs, 6-9 in. Size of Female: 2-6 lbs, 6-9 in. Visit our Chihuahua names page. 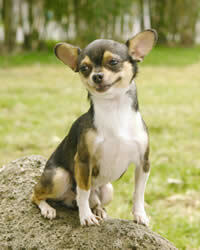 The Chihuahua dog breed is a tiny, loving and affectionate dog that tends to be very playful and funny. Their small size makes them popular as companion dogs. They generally focus intensely on one to two people, making them a favored breed for older couples. While Chihuahuas can be good watch dogs, they can also be very timid as the dog’s temperament varies greatly from dog to dog. They are a fairly “low maintenance” dog, with exercise needs being met running from room to room within a house. The Chi, as they are often known, is the smallest breed of dog. Although there is some controversy over the origin of this breed, most sources put it near Chihuahua, Mexico. The dogs were used by the Aztecs as a sacrificial dog and were greatly prized by Aztec royalty. At the conquest of the Aztecs by Cortes, this dog breed was left to itself and not seen again until 1850 when a few were brought to the United States from Mexico. The dogs did not, however, gain in popularity until one of the dogs was Xavier Cugat’s constant companion (Xavier Cugat was the first successful Latin orchestra front man). Since then the breed’s popularity has grown at an exponential rate (“¡Yo quiero Taco Bell!”). The Chi is fiercely loyal to one or two people and they thrive on huge amounts of attention. These little, fragile dogs are not very suitable for younger children, but will do better with older, more mature children. Because they become very attached to humans, they can develop a jealous streak if they sense they are not the center of attention. They can tolerate other pets, but early and proper socialization is the key. Living Environment – The Chi is an excellent house-dweller as their exercise needs can be fully met indoors. However, going on walks with their owners is beneficial and recommended. A warm environment is preferred. The Chi definitely makes the best apartment dogs list. Grooming – Grooming needs vary depending on the variety. The Smooth coat variant requires only occasional brushing, while the long coat variety needs several brushings a week. Both types need a bath only once a month with a mild and gentle shampoo. While bathing your Chi, be careful to avoid getting water into their ears as they are known to have problems with ear infections. For prevention of tooth loss, dental hygiene is greatly recommended. Diet & Exercise – These perky little dogs are quite active, but can actually get all the exercise they need by running from room to room indoors. However, they do enjoy exploring the yard and going for short walks. A regular walk will also lead to better socialization, less aggression toward other dogs and a less temperamental dog. When walking a Chihuahua, it is important to use a harness rather than a leash as they have a delicate bone structure which a leash could damage. Health – Their lifespan is longer then most dogs, living typically from 15-18 years. An open fontanel (soft spot on the head) is a common breed trait. In dogs, this condition is known as “molera,” or simply a “hole” in the head. Health problems include luxating patella, wheezing and snoring because of their short muzzle, and dental problems. These little dogs are very small with fragile bones and they should never be treated roughly. That?’s why they are not suited for small or ill-mannered children. While they can be harder to train than other dog breeds, early and continuous socialization is instrumental to producing a more stable temperament. The Chihuahua can be very tolerant of other animals if the animals have been properly brought up together. However, they may have problems with new and strange animals and/or people. Positive dog training works best with these little dogs, including lots of love, patience, and consistent work to bring the best results. I just got my Chihuahua pup from a breeder. A known breeder of other dogs, although the Chis are not those he enters in dog shows.